On Tuesday, the United States will host Argentina in the biggest, most important match in the history of the U.S. men's national team program. Maybe in American soccer, period. The U.S. will be playing in Houston in the semifinals of the Copa America Centenario against Argentina, the top-ranked team in the world, featuring the best player on the planet, Lionel Messi. It will not be one of the ever-popular summer exhibitions that bring the sport's biggest stars to America to play preseason friendlies with their European league clubs. This game will matter. And it will be a huge opportunity for the Argentines, especially for Messi. Winning the 2016 Copa America would be a legacy-defining moment for the Argentina captain after leading his country to the finals of the 2014 World Cup and the 2015 Copa America only to fall short. Capturing the Argentines' first major tournament title in 23 years would cement the Barcelona star's place among the all-time greats. As such, Messi will go the full 90 minutes with his famous left foot on the accelerator, while the Americans attempt to pull the hand break on what appears to be the best team in the world. 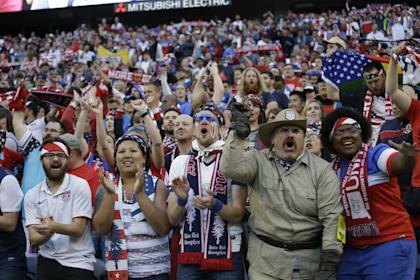 Win or lose, the U.S. should draw unprecedented television ratings. The Americans' previous three matches in the Copa America each broke records for Fox Sports 1 in terms of the network's most watched soccer matches ever. The sport is growing, and American sports fans are jumping on board with this Copa America Centenario, a special 100th anniversary edition of the South American championship that also involves teams from North and Central America, and the Caribbean. What is all the more incredible about the record 2.132 million viewers who tuned into the USMNT's quarterfinal victory over Ecuador last Thursday is that Game 6 of the NBA Finals was played at the same time. In fact, the NBA Finals got a 30-minute head start on the Copa America and also concluded after the USA-Ecuador match. With the NBA Finals over and only baseball competing for sports-loving eyeballs, even casual American sports fans should be interested by Tuesday's unique opportunity to see the best player and the best team the sport has to offer. Soccer in America has already experienced growth spurts in the two decades from the 1994 World Cup to the 2014 World Cup. It can reach new heights with this prime-time showdown against Argentina mostly because of Messi, who is already a big enough star that his name even sounds familiar to non-soccer fans. A U.S. victory would put the exclamation point on America's "summer of soccer" – a three-month showcase of the sport comprising the Copa, ESPN's coverage of the European Championships, next month's International Champions Cup preseason tour of Europe's top clubs and the U.S. women's national team at the Rio de Janeiro Olympics in August. Over recent years, major television contracts with NBC, Fox and ABC/ESPN have made top-level soccer more accessible than ever in America. Year after year, NBC continues to report improved Premier League viewership numbers, while ESPN regularly features soccer highlights on "SportsCenter." Also, Fox now airs the UEFA Champions League final on network television, not cable. On Tuesday, Messi arrives into the mainstream of American sports with a meaningful game on U.S. soil, and soccer in this country cannot lose. If Argentina carves up Jurgen Klinsmann's men and wins big, which is more likely than not, the genius and greatness of Messi is sure to impress casual sports fans tuning in, perhaps even attract new converts to the church of soccer. After all, he is that great. If the U.S. hangs on with – or even beats – Argentina, Americans will celebrate the fact that they faced the best and held their own, or better. It would be viewed as an example of the growth of the men's national team on the pitch. Psychologically, that would be a huge victory for U.S. soccer because watching the Red, White and Blue win never seems to get old in America, does it? Regardless of the final score, the Copa America semifinal in Houston is shaping up to be the most meaningful match in the history of American soccer. The USMNT's 2002 World Cup quarterfinal against Germany and 2014 World Cup round-of-16 game against Belgium don't stack up, as both of those matches took place on foreign soil. Also, soccer has grown leaps and bounds in the American consciousness in recent years. With the best player in the sport displaying his talents in a once-in-a-lifetime matchup against the U.S. and a TV audience of millions watching, Messi's Argentina battling the Americans will be remembered as the greatest single day of growth in the history of U.S. soccer.